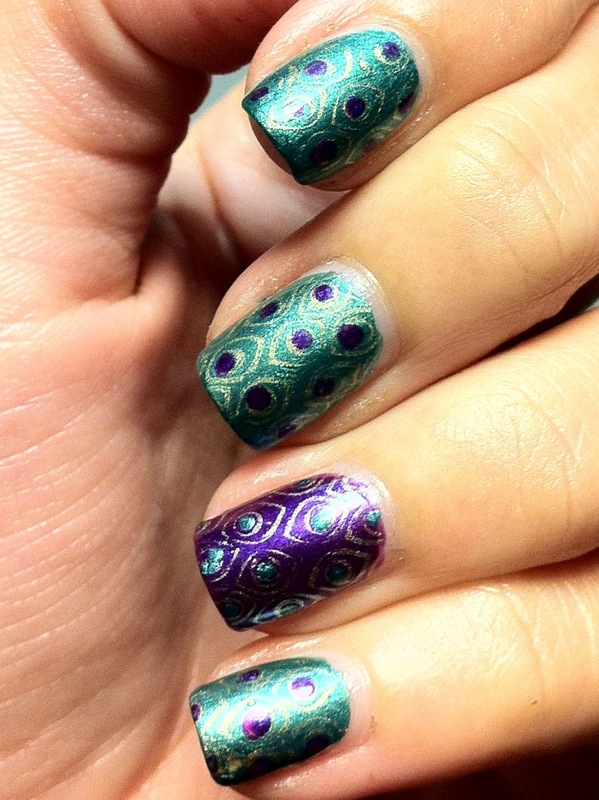 From the Vault: Guess the polish! Do not ask me why I never published this! I thought that I had already published it considering I had it all typed out and this was actually my New Years DAY mani. =/ My age is definitely catching up with me. Anyways. May I present to you my New Years Day manicure, 3 months late nonetheless! Let me warn you beforehand though that this post is gonna be photo heavy as I took a whole lot of photos everywhere under different lighting and most importantly, the polish is just too gorgeous to not show it off! I picked a really interesting polish combination to start my New Year! Can you guess which polishes I used? I got this from a swap not too long ago, and as you know, I have only done one swap so far. OK, fine. To be fair, I am wearing 2 polishes on my nails in these photos and both of them are from the same swap. Well, the answer is – Max Factor’s Fantasy Fire over T.B.N Gorgeous Grape. T.B.N. Gorgeous Grape is a really deep dark maroon which oftentimes look black if you don’t look too closely. Fantasy Fire, I think this polish needs no more introduction! It is a gorgeous blurple base with multichrome shimmer that shifts to red to copper to green to gold depending on what lights hit it and what color you choose as a base! I think my choice of base color brought out the red/gold in Fantasy Fire. It just enhances and brings out the hidden red of Gorgeous Grape. Whenever the shimmer shines red, it gives the polish so.much.depth. I can’t stop staring at it! I also managed to grab a few photos that showed off the different shimmers in Fantasy Fire! There was the elusive (for me) olive green. And all I had to do was turn around in circles catching the sunlight on the balcony. I included a not-so-awesome-blurred shot to show off the sparkly quality of Fantasy Fire. And finally – a night shot! I couldn’t believe my eyes when I saw this! Fantasy Fire even looks gorgeous under a street light at night! I took this in the car while picking up a friend. I didn’t really notice at first but when I glanced down at my nails I was blown away and attempted a photo with my crappy camera (and succeeded to capture one good photo!). I’ve got a quick post for you before I head off to work this morning! This is Rad Cloud from Hare Polish. The first of my Hares in fact! I decided for a first go I would wear it on it’s own (3 coats). The glitters in the base is just gorgeous. And it all came out so easily too! I did not have to dab anything on. I actually love this polish in the bottle. On my hands – not that much. Maybe I just need to get used to the color purple? It resembles pink a wee bit too much for my liking. I am not sure, should I give it another chance (layer it over something) or should I put it in my blog sale? 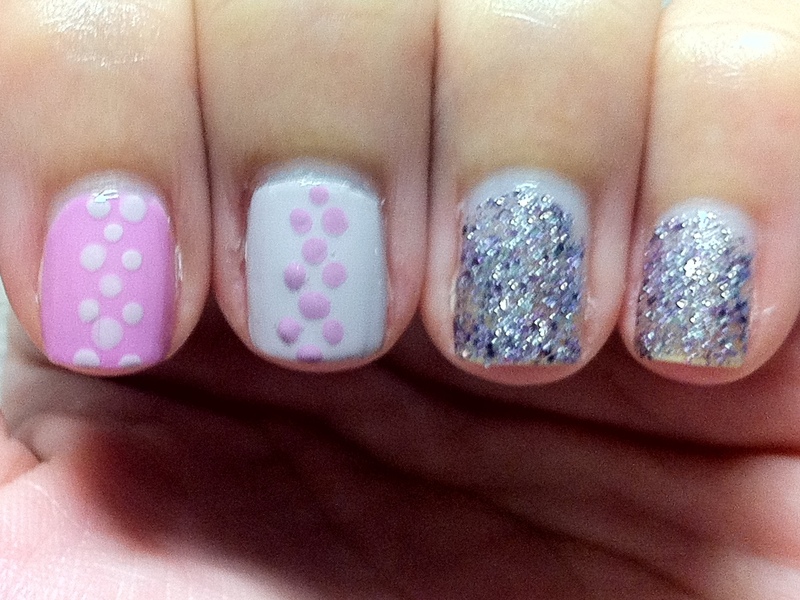 I thought I would jazz up the previous mani just a little and since it’s Polka Dots day why not! I initially wanted to do dots on the whole nail but a failed attempt on my thumb led me to do otherwise. I finally settles with just a strip of dots running down the middle. I think it turned out rather OK.
For the dots I used Lucky Lucky Lavender on Lilac, Steady As She Rose on Lucky Lucky Lavender and Lilac on Steady As She Rose. 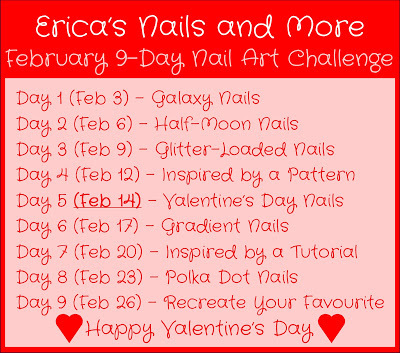 More untried polishes in this post! Actually, out of the 4 polishes I have on my fingers in this post, 2 are untrieds and the other two haven’t been used in quite some time! I was thinking of a way to use all 4 polishes.I finally settled on a skittelette manicure to tackle this task. In shades of purple again! I think purple may just be my new favorite color. The idea was to do a ombre manicure at the same time actually, one of the many nail art techniques that I have yet to pull off successfully! What do you think? Does it count as an ombre manicure? I used these colors Color by T.B.N Lilac (thumb), OPI Lucky Lucky Lavender (index finger), OPI Steady As She Rose (middle finger) and on The Hungry Asian Vote for Purple (ring finger and pinky). I tried some free handed chevrons and I think they came out quite good! I wanted to do something simple that wouldn’t take away from my base color a.k.a Shockingly White from yesterday. 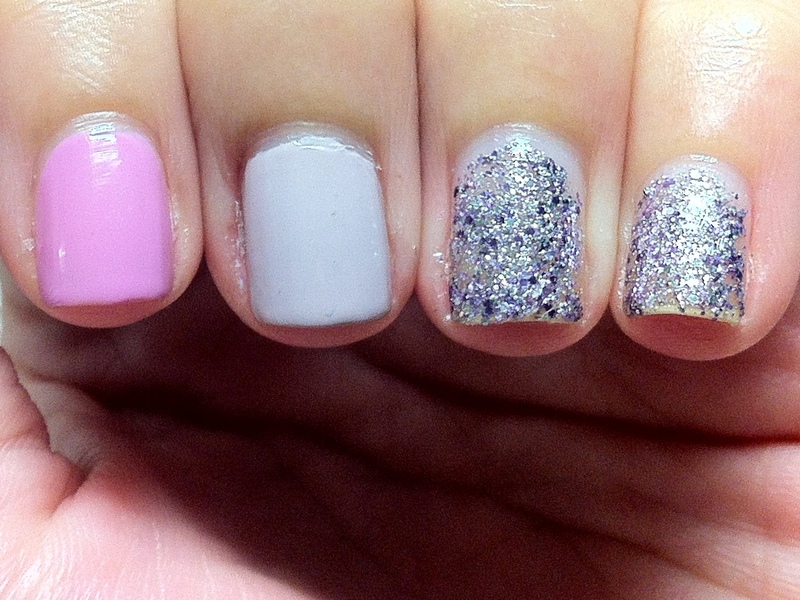 I decided to match my tips to the glitters in the polish; and why not put a white in it for contrast! 10 minutes of careful painting and waiting….. Voila! 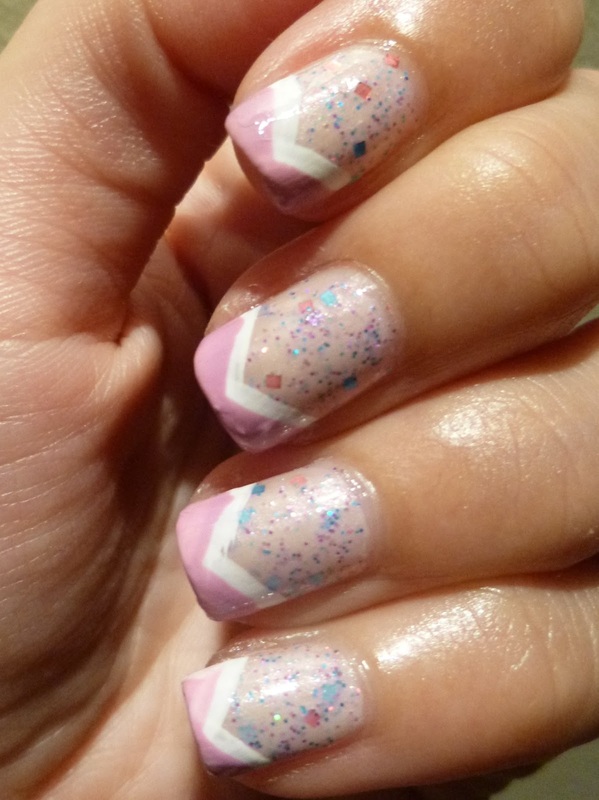 I used OPI Alpine Snow and Lucky Lucky Lavender to create the chevrons. I used the brush in the bottles to do this too. 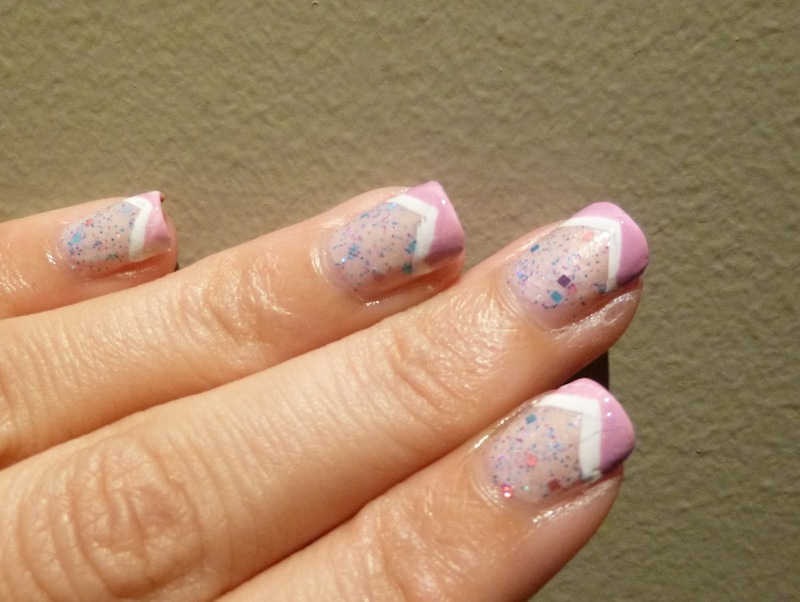 No striping tape or stripng brush needed! 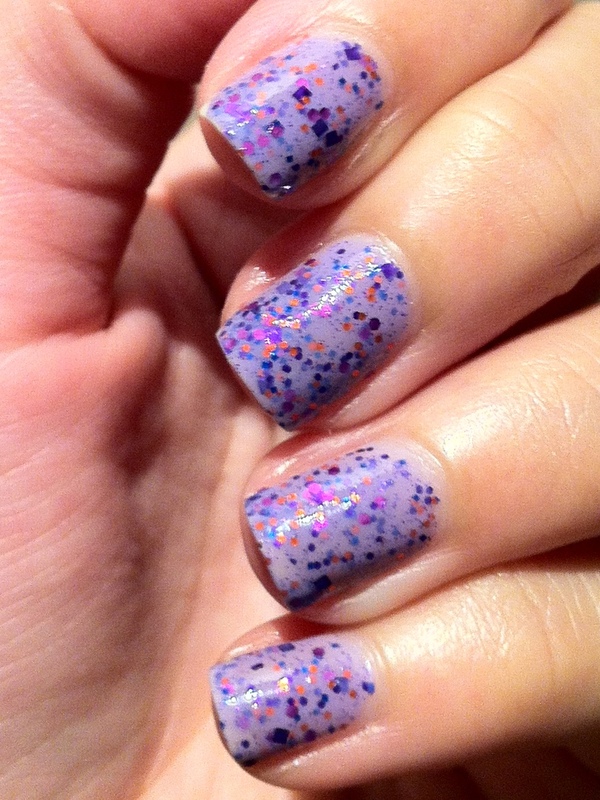 I picked Lucky Lucky Lavender because it brings out the pink and purple glitters in this polish as well as match the funkiness in the base color. And Alpine Snow being a pure white gives a good contrast between the two colors. And a bottle shot to end this post because I haven’t done one of these in a long time! I am not so handy with a paint brush for nail art. Or with striping tape for that matter. 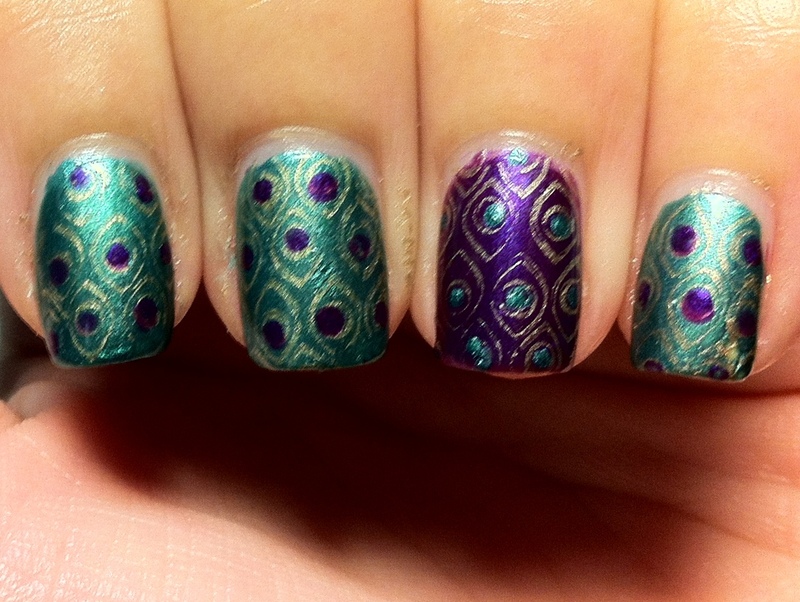 So my next course of action for patterned nails – stamping! 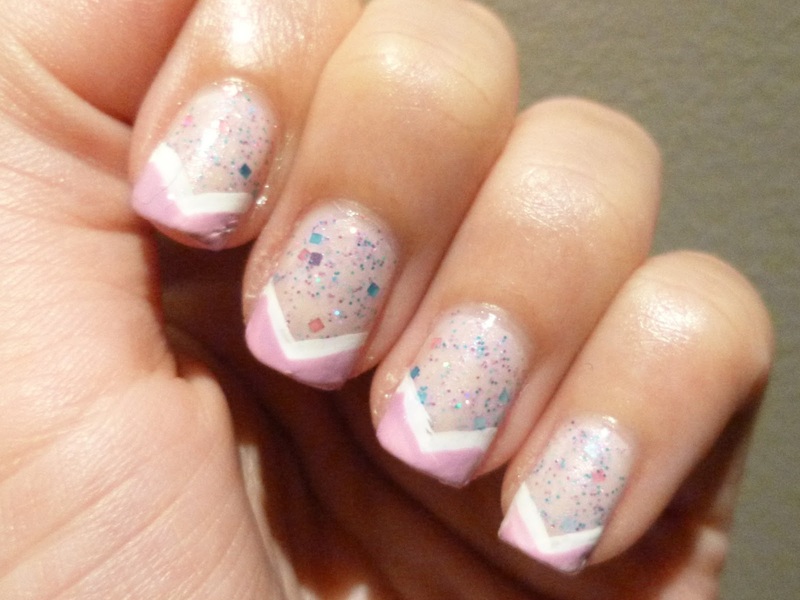 When I first saw this design on nail blogs, it was love at first sight! I always wanted to get it but it seemed that no one was selling just a single plate with this design (BM212). After I found out that it was from Bundle Monster 2011 25piece collection I hesitated to get it. Stamping just ain’t my thing y’know. After many months of trying to stamp and getting rather good results, I started to stalk Bundle Monster’s website and tried buying it a few times but my order got rejected more than once. Gah! 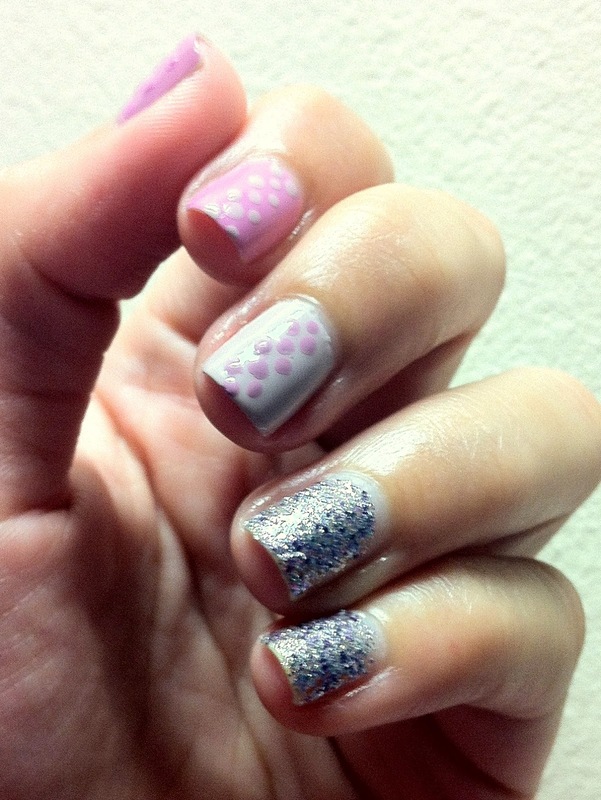 I stamped the image wiith China Glaze Passion and dotted the pattern with opposite colors. Somehow my dots weren’t as equal sized as they should be. I need more practice! I wanted to finish this manicure with a funky ala Fingers from Fingers Polish Mania but failed so bad I did not photograph it.